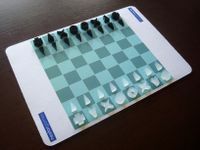 This portable and beautiful edition contains: cotton case, board, set of black pieces, set of 'ice' white pieces. The pieces are made of 8mm thick laser-cut acrylic. The shape of each piece is inspired on its type of movement.